We may be biased but we think the U.P. has some of the best snowbiking trails in the country! In Marquette all Noquemanon Trails are open to snow bikers on Wednesdays after 5 pm and Saturdays after 3pm. Trail is also snow biker friendly from The Marquette Board of Light and Power Tourist Park Trail head to the the NTN Forestville trail head at all times. Haven’t riden here yet? Check out the video from our talented friend Aaron Peterson! Cold Rolled: Marquette Michigan’s Snow Bike Route, is a quirky action documentary from Clear & Cold Cinema, Salsa Cycles and TravelMarquetteMichigan.com that explores the history and progression of winter cycling culture in this small Lake Superior harbor town. Marquette, Michigan’s Noquemanon Trails Network has nearly perfected equipment and techniques used to launch its Snow Bike Route, a 15-mile winter singletrack developed for fat tire bikes. The fast narrow trail features flowy terrain, steep descents and large bermed turns. 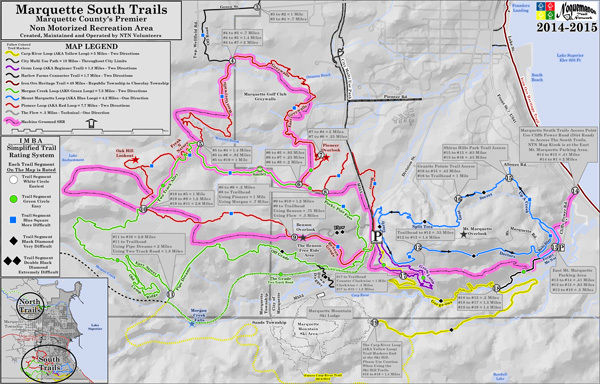 It’s believed to be the first trail of its kind–but more importantly, it’s pretty fun.